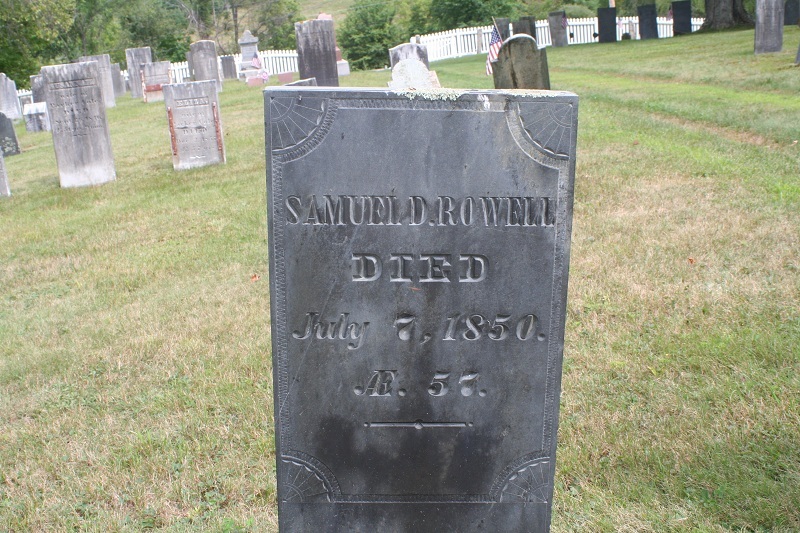 Samuel Duncan Rowell was born in 1793, ten years after the conclusion of the American Revolution. His birth date places him at a time where, at least for me, it is hardest to find solid information about his life. It makes it difficult to fill in any details about him other than dates. I expect, as I start this, that this post will be pretty short, but I'll see what I can come up with. Samuel was born, as I said, on 10 July 1793, in Grantham, New Hampshire. His father, Enoch Rowell, had moved there from Candia following the Revolutionary War. When looking at the town records for Grantham I noticed that one of the most prominent men in town was one Samuel Duncan. 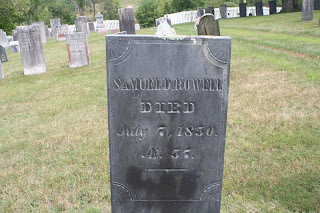 He died on 9 July 1793, a day before our Samuel's birth and I would bet a buck that our Samuel Duncan Rowell was named in honor of Lt. Samuel Duncan. By 1800 the census shows that the Rowell family had moved one town over to Plainfield, where Samuel would remain for the rest of his life. Samuel, like most of his ancestors before him, was a farmer. He married Mary (Polly) Moore on 2 March 1825 in Grantham. Their first child was born seven months later. They had eight children in all. Of interest to me is that this is the first generation of Rowells that were given middle names, although I do not know what some of them were, just their initial. 6. Enoch Converse b. 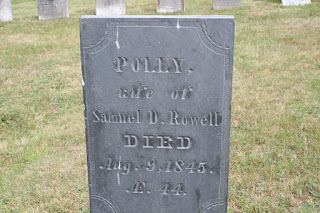 1835 Plainfield, m. Viola Rowell his first cousin, d. 1900 Albany, Vt.
7. Julia Ellen. b. 1838 Plainfield, unable to trace. 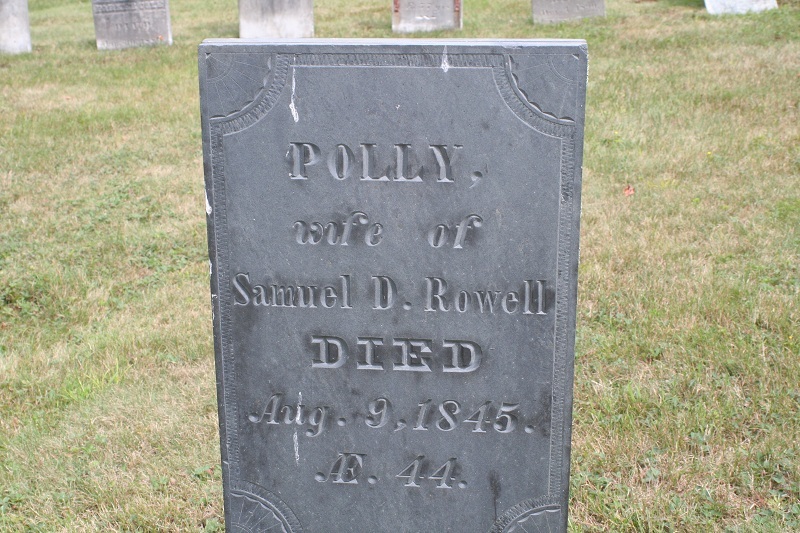 Mary, known as Polly, died on 9 August 1845 aged 44, her husband Samuel died five years later on 7 July 1850. In the 1850 census, taken shortly before Samuel died, all the children lived at home. Their Aunt Rachel Rowell also lives with them. When he died their youngest child was 10, Enoch my ancestor was 15. The children's uncle Jacob Rowell was still living in Plainfield so I imagine he would have taken them in after their father's death. Enoch left Plainfield and was in Albany, Vt with his Uncle William by the 1860 census. Three of the girls, Judith, Emmaline and Sarah Ann left Plainfield and headed west with their families, Emmaline died in Dane County, Wisconsin. Sarah Ann and her family lived there for a while before moving on to Minnesota where she died.